A new report by the Alzheimer’s Association released on Tuesday makes clear the challenge of the increase in cases of Alzheimer’s disease, and the necessity of helping at-risk populations prepare for the upsurge in new cases—and one day prevent Alzheimer’s altogether, Rep. Chris Smith (R-NJ) stated. “We’ve come a long way toward understanding and treating Alzheimer’s disease, and are moving ever closer to a cure, but this report lays out the challenge yet before us and the necessity of preparing individuals and families on best practices for medical care for a loved one with Alzheimer’s,” Smith said. “We need to redouble our efforts to help the 5.8 million Americans with Alzheimer’s, along with their loved ones and caregivers, and to advance treatments,” said Smith the co-founder and co-chair of the bipartisan Congressional Task Force on Alzheimer’s disease. According to the Alzheimer’s Association’s 2019 annual report released on Tuesday, 5.8 million Americans currently have Alzheimer’s, the sixth-leading cause of death in the U.S. and one for which there is currently no cure. The number of those age 65 and older with Alzheimer’s is expected to rise by 27 percent over six years to 7.1 million by the year 2025. The estimated cost of Alzheimer’s health care in the U.S. is currently $290 billion, the report noted. The cost is expected to balloon to over $1.1 trillion in 2050, with both government and private out-of-pocket expenses quadrupling. 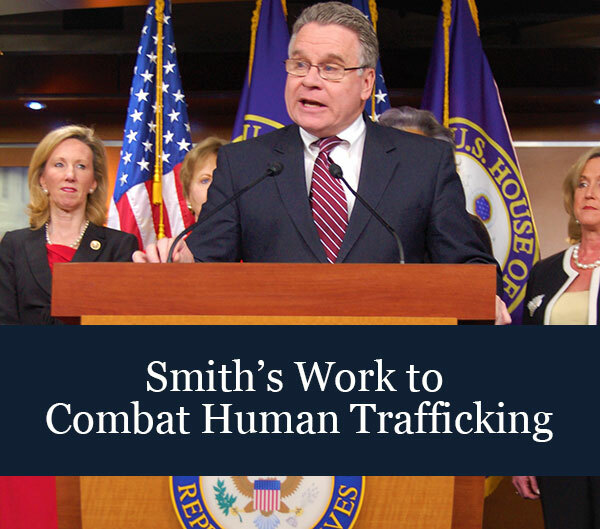 Smith is the Ranking Member of the House global health subcommittee, and has held four Congressional hearings—in 2017, 2014, 2013, and 2011—on global strategies to treat and prevent Alzheimer’s and other related dementias. Key provisions of Smith’s Kevin and Avonte’s Law were enacted into law in 2018 as part of the Consolidated Appropriations Act. The law funded wandering prevention programs for children with autism and elderly persons with Alzheimer’s at $10 million over five years, and expanded the Missing Alzheimer’s Disease Patient Alert Program to the Missing Americans Alert Program. At the end of 2018, President Trump signed into law S.2076, the BOLD Infrastructure for Alzheimer’s Act, which Smith helped push through. The new law awards cooperative agreements for the establishment or support of national or regional centers of excellence in public health practice in Alzheimer's disease. Smith also was the lead House Republican in helping to pass the National Alzheimer’s Project Act in 2011, which created a national strategy on Alzheimer’s with the goal of finding a cure or disease modifying therapy by 2025, and created an advisory committee for a whole-of-government approach to preventing and treating Alzheimer’s. Among other findings in Tuesday report, the vast majority of seniors—six out of seven—are not receiving regular assessments of their cognitive health during routine medical check-ups, which could help detect symptoms of Alzheimer’s, and only half of seniors are even being assessed for their cognitive health. In 2015, Smith introduced the House version of the HOPE for Alzheimer’s Act (HR 1559) to help patients and their caregivers plan for long-term care by providing a permanent Medicare benefit for care-planning sessions; Medicare implemented core provisions of the legislation in its final rule for the 2017 Physician Fee Schedule, covering one comprehensive care-planning session for patients and their caregivers.